Capture had the opportunity to interview Olivia Bull, one of the local budding photographers currently showing at Gallery 295. The gallery is connected to The Lab, and this is the second annual Juried exhibition. The closing reception is this Saturday, July 5, from 2-4pm. You can see details about the other photographers and the gallery here. I began taking photos in high school with an old Nikon of my dad’s. Since then, I’ve always had a penchant for image making, but it was after I finished my undergraduate degree at McGill University that I really got serious about it. With no fixed plans or further schooling in mind, I suddenly had a lot of time of my hands. Photography became a constant for me then, I was able to go out and shoot most days for hours at a time. I essentially taught myself through trial and error. Many of the photographs shown at the Index show at Gallery 295 are a product of those last few years. Do the photographs in this exhibition have a particular theme? My photographs displayed at the Index show are a loose constellation of images connected by shared repetition of colour and form. I’ve titled the works Apophenia, a new word denoting the human tendency to seek patterns in random information, a process directly reflected in my photographic practice. Through the use of a closed perspective, and the recurrence of line, shape and colour contrast, the works deliberately deny one’s entry into the image, forcing the eye to dance repeatedly over the surface in pursuit of the pattern. This superficial visual process allows one to oscillate between seeing an object as an abstraction and recognizing its representational form. The carefully framed subjects in the photographs isolate discrete elements in order to reveal hidden geometries of everyday life. Thus, Apophenia is as much a search for regularity and meaning as it is an aesthetic pursuit of the internal logic of visual perception. Are there prevalent ideas and concepts on which your photography focuses? My photographic practice examines spatial order and visual movement through a compositional exploration of pattern and colour. Often tending toward the abstract my images are eerily devoid of human figuration. I nevertheless try to highlight visually arresting arrangements of colour, and rigorously compose my photographs to create an abstracted sense of place. Is your photography expressive of ideas and aspects you see in Vancouver? Vancouver is and has been my home for many years, so I find it difficult to take a step back and analyze how much of Vancouver is inherent in my work. Generally, as my primary residence, Vancouver scenes feature prominently in my subject matter. Yet, because my photographs often isolate discrete elements of a situation there are many which do not seem indicative of this place per se. Rather, my subject matter – a crooked tree trunk, a doorstep – form the small pieces which together comprise my way of seeing Vancouver. Further, because this city is laden with with natural beauty, I try to find subject material that is subtly beautiful, and subliminally rather than obviously ‘Vancouver’. 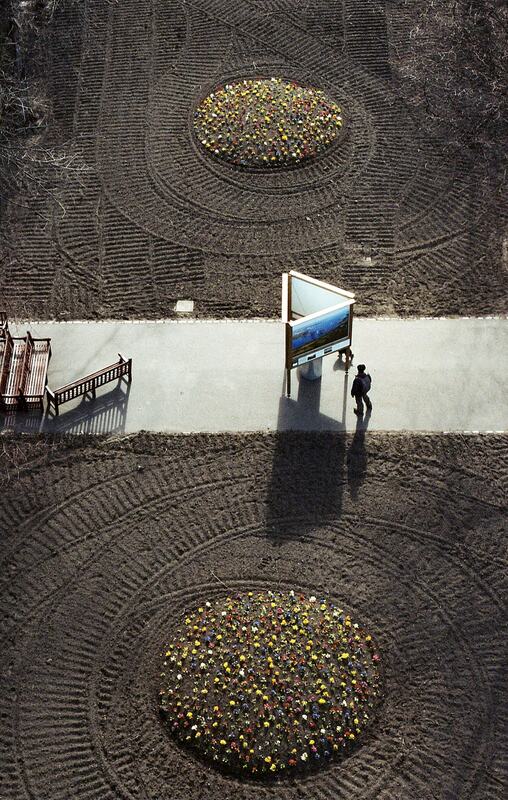 Image Credit: Crop Circles, Olivia Bull. 2014.